Better late than never. I know I'm running out of time to get this one done. So here it is! This is the easiest tutorial ever! I mean it. Anyone can do it. 1. Mark your Cloths Pins with your Sharpie starting at 1 Month and going through 1 Year. I actually started at 1 minute, 1 Day, 1 Week, and then 1 Month. You can do it either way or you can skip this entirely. It's up to you! 2. 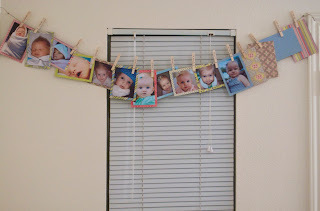 Take 4 pieces of double sided tape and attach to the 4 corners of desired photo. 3. Choose paper, line up photo so that it looks straight and even, and stick to paper. Trim if needed. To make this process easier I got a Mat Pack. Which is a pre-cut pack of cardstock. 4. Hang up twine. Hammer the nails into the wall and cut twine to desired length. Double knot twine around nails. Make sure the two nails are level with each other. 5. Pin pictures to twine and you are done! So simple! I have put together a Photo Line Kit to Giveaway. It includes Cloths Pins, Twine, Sharpie, Double Sided Tape, 2 Nails, and an Amy Butler Mat Pack. The paper can be used for either a boy or a girl. Or you don't have to use it for a kids room at all. It could also look cute in an office or hallway. Wherever! So leave a comment by Sunday Sept. 21. The winner will be announced Monday Sept. 22nd. I'm going to start doing tutorials on a monthly basis. So check back on the 15th of each month for something new. Until then I hope you enjoy my other musings! Making Finn's room actually cute looking instead of piles-of-crap-that-doesn't-go-anywhere-else-looking is my next goal...So I hope I win! If not, I'll for sure follow your tutorial and make one myself! I love that, I think I may try that with some of my scrap booking stuff. But a little bit of a boost with a pre-made kit would be a big help too, hope I win something for a change! So Cute! Sign me up! Super Cute Idea!!! I love looking at your blog and all the cute ideas that you come up with! Thanks to your sis' jessy for telling me about it. Make Believe Frock GIVEAWAY !!!!!! !